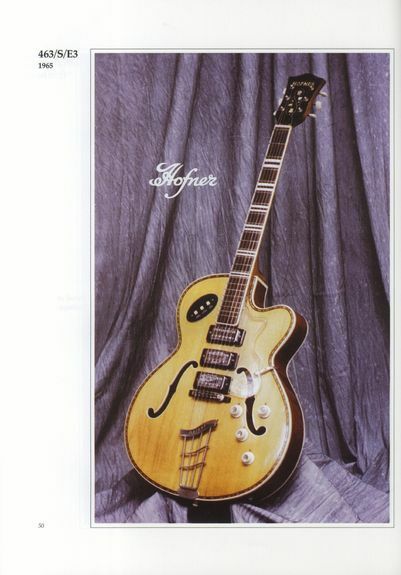 Many of you will remember I'm sure the Hofner book that IMP brought out onto the market way back in 1993.This book has been out of print for a number of years, and at one point it was fetching up to £75 a copy on E-Bay. Well, it is now out there again but this time with the Hal Leonard publishing group. I have to say that they have done a fantastic job. The book is pretty much the same as it was apart from the cover and new colour photographs plus an extra chapter written by Paul Day detailing "Hofner yesterday and today" featuring some of the super newer models. There is also a brand new Preface written by me! We did submit some current photographs of Nev Martin my co author and I, but for some reason they have printed the originals from 16 years ago. Never mind I like to look younger! Happy reading all you fellow guitar anoraks. Written by Gordon Giltrap and Neville Marten. A true classic, back in print with an updated section covering 1994 to today! 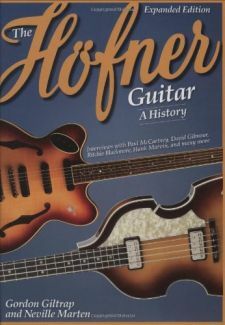 This book celebrates the glory years of Hofner, the company made famous by the Beatles' bassist Paul McCartney's use of their left-handed 1962 500/1 model. Beautifully illustrated in color and black and white, the volume is packed with detailed information about classic Hofner guitars as well as interviews with Paul McCartney, David Gilmour, Ritchie Blackmore (of Deep Purple), Albert Lee, and others. 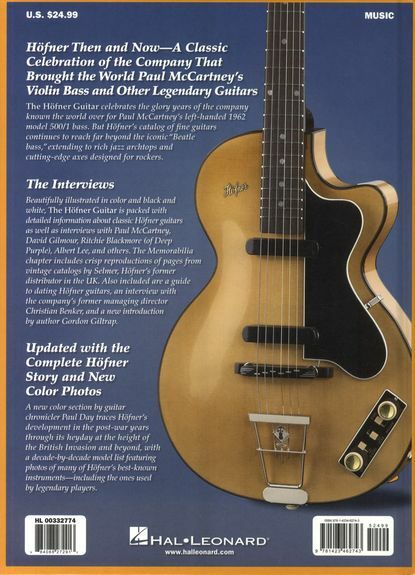 The famous "Memorabilia" chapter includes crisp reproductions of pages from the vintage Selmer catalogs (the UK's Hofner distributors); a guide to dating Hofner guitars; and a wonderfully insightful interview with Christian Benker, the company's former managing director.A new section features a company history and a listing with selected photos of Hofner guitars from the '60s to the present. 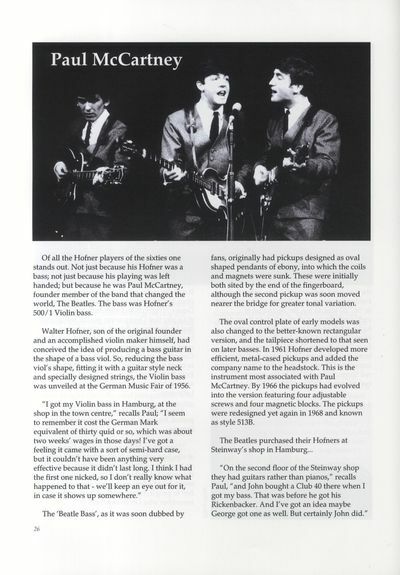 Neville Marten has contributed to The Hofner Guitar: A History as an author. Neville Marten was a guitar repairer for Gibson and Fender's UK operations during the 1970s and 1980s, working on a host of valuable and rare guitars, including Hendrix's "Woodstock" Stratocaster. As current editor of "Guitar Techniques" magazine and former editor of "Guitarist", he has met and interviewed dozens of legendary guitarists, from Eric Clapton and Mark Knopfler to Brian May and George Harrison. He plays guitar in British rock and roller Marty Wilde's Wildcats, a position he has enjoyed since 1983. First Published 1993, now out of print, this edition of the book is very hard to come by, and has been known to fetch ridiculously high prices on the second hand market, in places such as Ebay.